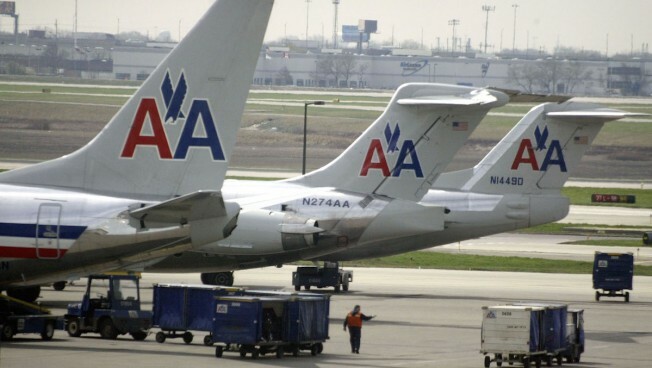 In this file photo, American Airlines jets sit on the tarmac at O'Hare International Airport on April 25, 2003 in Chicago, Illinois. American Airlines announced Monday new restrictions for emotional support animals on flights, joining other major carriers that are tightening the leash on onboard comfort pets. According to the new guidelines issued by the world's largest airline, American no longer recognizes goats, ferrets, insects, snakes, hedgehogs, amphibians, reptiles, rodents, spiders and sugar gliders as emotional support animals. 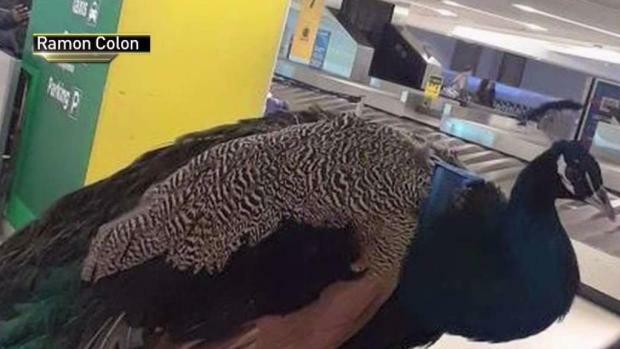 The airline said non-household birds such as "farm poultry, waterfowl, game birds and birds of prey” as well as "animals with tusks, horns or hooves" will also be banned from boarding flights as comfort pets. Citing a 40 percent increase in passengers bringing animals in the cabin from 2016 to 2017, the Fort Worth, Texas—based company adopted new documentation rules for emotional support pets. To travel with an approved emotional support animal in the cabin, passengers must fill out a form at least 48 hours before their scheduled flight and provide the name and contact information of their mental health professional who can attest to the need of a service animal, American Airlines said. The pre-clearance will now include a documentation validation by American Airlines from the mental health professional. American said it will have procedures in place for emergency travel booked within 48 hours of a departure. The form also requires that the passenger assure the airline their animal will not block the seats or the aisles of the cabin, and will not threaten the health and safety of other passengers. On flights over eight hours, passengers must provide documentation assuring the airline that their animal will no defecate onboard the plane “or do so in a way that doesn’t create a health or sanitation issue." The new policy takes effect with tickets issued on or after July 1. "Prior to enacting these changes to our animal policy, American met with a number of disability groups to get their input, including American Association of People with Disabilities, Paralyzed Veterans of America, American Council for the Blind and My Blind Spot," the airline wrote in a blog post. "At American, we want to have policies and procedures in place that protect our team members and our customers who have a real need for a trained service or support animal. We appreciate the dialogue and partnership we have with these organizations." Federal law allows passengers to bring animals into the cabin that provide emotional support or assistance to fliers with disabilities free of charge, according to The Associated Press. The U.S. Department of Transportation announced Wednesday that it is considering rules to “address the appropriate definition of a service animal,” and seeking public input online. Earlier this year, United Airlines announced new rules for emotional support animals. The updated policy includes a vaccination form signed by a veterinarian and assurance from the the vet that the animal isn't a health or safety threat to other people. United's changes mirror those implemented by Delta Airlines. In January, the Atlanta, Georgia-based company unveiled tighter rules for passengers flying with emotional-support animals. 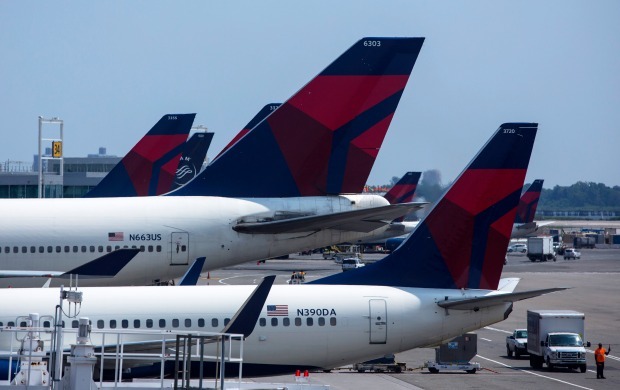 "The rise in serious incidents involving animals in flight leads us to believe that the lack of regulation in both health and training screening for these animals is creating unsafe conditions across U.S. air travel,” John Laughter, Delta’s senior vice president for corporate safety, security and compliance, said in a news release. "As a leader in safety, we worked with our Advisory Board on Disability to find a solution that supports those customers with a legitimate need for these animals, while prioritizing a safe and consistent travel experience."